Written by Janet Choi on October 26, 2016 . You have excellent relationships with all your customers and a pulse on every single one of their needs, right?… It’s nearly impossible to stay on top of this. Enter Edward-Bot, who diligently checks on DigitalOcean users. Edward-Bot flags whoever might need help from a real human representative: When VIP users exhibit behavior that indicates intent to churn—defined here as destroying “droplets” at a high rate—Edward-Bot alerts the DigitalOcean team by delivering notifications in real-time to the company’s #customer-success Slack channel. From there, the team knows immediately who to reach out to and when. Edward-Bot is even programmed to share the user’s typical behavior pattern to help give the humans important context. Edward-bot frees up the customer success team to focus on more complex priorities while alerting them when it matters. It’s part of the company’s customer-first approach of paying close attention to user behavior and account health to create a great customer experience. In fact, this strategy helped decrease VIP churn to 0.69%. Of course, not every team has the developer-time or resources as DigitalOcean to create their own Edward-Bot. 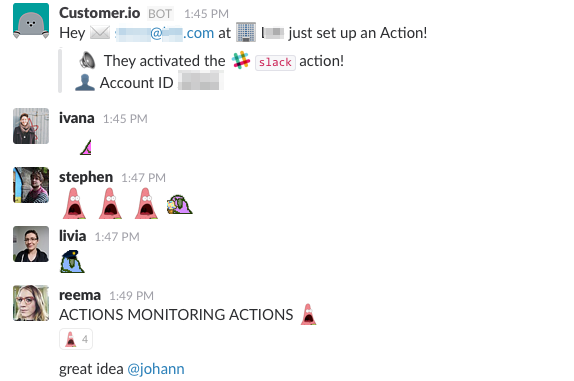 That’s why we’re excited that our new integration, Customer.io’s Slack Action helps any team create their own customer pulse Slack bot. Let’s explore what types of customer data to send into Slack and how this automation can help your team work better, together. Responding intelligently to customers requires understanding how they’re behaving. If you’re using Customer.io, you’re already sending that behavioral data through to create segments and messaging workflows. Simply add Slack Actions to funnel that data into Slack. By setting up super-precise automation rules based on your customer attributes and behavior, you can trigger messages to designated channels or directly to team members. Create specific channels for behaviors to monitor, like #new-users or #VIPcustomers, or add them to existing ones in use. This type of information works well as an activity feed in dedicated channels. That provides a lightly-curated stream into which people across teams and roles can dip their toes but not have to constantly pay attention. Creating Slack notifications around user behavior can prove costly if it adds to notification overload. Dedicated channels are a good defense, as people can mute the channel to avoid getting pinged with every message but still check in. Or whatever is important to you! It’s important to keep iterating to figure out what your most important user actions and attributes are, so that you respond to important behaviors right when they happen. Here’s an example of a Slack Action that triggers upon account signup when someone enters comments in the signup form, furnished with a combination of user-entered and Clearbit-enriched data that help give context. When our sales team sees a Slack message like this, where someone signing up has relevant questions, shows a ready willingness to buy, and has target attributes — they know it’s go-time to get in touch! At many companies, employees might not have much, or even any, interaction with customers or visibility into what users doing in the product. Even those who do, like people in customer success or support, probably hold pieces of the puzzle rather than the whole. While this could be a transparency or access issue, the culprit is often time. Who has time to be rooting around in user accounts and dashboards every day for slivers of information, with everything else already on your plate? And when you do search, it can take a long time to get what you need. (According to some surveys, people spend 20-30% of their time at work looking for information!) When information you need isn’t in easy grasp, you risk missing opportunities and operating in the limited confines of a knowledge gap. Surfacing key information right in Slack provides an easy path to understand what’s going on with customers—without having to context-switch—and kickstart real action. Everyone can gain some knowledge of key activity going on in the product, which leads to better alignment and collaboration. When there’s a new feature release and churn spikes, for example, engineers should know that, not just product managers! Let’s get meta with one way we’re using Actions at Customer.io. To keep an eye on the new feature usage, we set up a Slack Action that triggers when users configure a Customer.io Action: Here’s what the Action looks like under the hood, in the workflow composer: One of our company goals for the Actions launch is strong customer adoption. Using the Slack Action is a neat way to see if we’re making adoption progress and identify which Actions are getting faster uptake (Slack is winning!). Customer actions speak a thousand words, but if you’re not paying attention to behavioral context, you’re letting lots of opportunities slip by. As (human) Edward from DigitalOcean says, it’s impossible to know exactly what everyone is doing in your product at all times. And it doesn’t make sense for jobs like Edward-bot’s to belong to humans—those tasks are boring, repetitive, and distract from higher-impact work. Instead, the smarter choice is to automate around that issue to deliver critical nuggets of intelligence. Creating your customized customer-pulse Slack app helps you grow by providing the seeds for increasing team collaboration, alignment, and agility. We’re excited how Slack Actions unlocks your customer data from dashboards and disparate sources to make it transparent, timely, and actionable. Learn more about how our Slack Action works. Share your smart Slack Action workflows here or come chime in with questions and feedback in Product Hunt!